When you have been hurt in any kind of accident, the attorney you choose to handle your case can make a difference in the eventual outcome. Some lawyers are content to file the necessary paperwork and allow the case to work itself out while others are more willing to take proactive control of the situation. At Hoggatt Law Office, P.C., we understand that attorneys who are proactive get the best results. That is why we work hard every day on behalf of clients in Louisville, Boulder County, and throughout northern Colorado. Our client-first approach has helped us secure millions of dollars in settlements and verdicts for our clients, and we are ready to put our knowledge and experience to work for you. Louisville, Colorado is home to a wide variety of businesses from many different sectors, including several high-technology companies and medical supply manufacturers. Unfortunately, every worker is at some risk for injury while on the job, and each year, thousands of Colorado workers miss time due to workplace injuries. Injuries related to fires and explosions. It is important to act quickly after a workplace accident, and we can assist you in protecting your eligibility for benefits. In addition to workers’ compensation cases, our skilled attorneys are also adept at handling all types of personal injury matters. We aggressively represent victims of car, truck, and motorcycle accidents as they pursue the compensation they need to move forward with their lives. At Hoggatt Law Office, P.C., we take the time to conduct a full investigation into the circumstances of your accident so that we can identify any and all parties who may be liable. From there, we will start building a case designed to get you just compensation under the law. We will negotiate with insurance companies in pursuit of a settlement, but we are prepared to go to trial if necessary. If you have been injured in a traffic accident or while on the job, contact our office. Call 970-225-2190 to discuss your available options in a free consultation today. 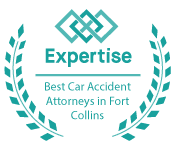 Our firm serves clients in Louisville, Boulder County, and the surrounding areas.